Are you missing a tooth due to an accident, sports, or have you had a tooth removed? When you’re missing a tooth, that can really bother you and impact your self-esteem. Permanent solutions such as crowns, bridges and implants can be expensive. 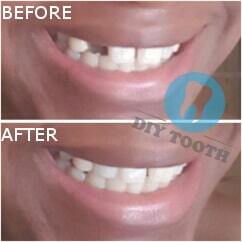 The DIY tooth is a simple “do it yourself”-solution in order to allow your smile to shine again. With the temporary tooth you can make a realistic, temporary tooth – on your own, and for only £14,95. With the special material, which can be moulded through warmth, you make a tooth. The material is safe, harmless and biodegradable. 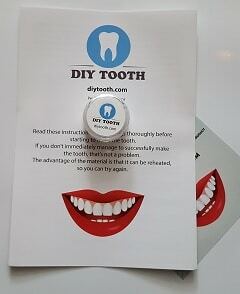 You can easily make the tooth yourself using the included instruction manual. The tooth can be coloured so it looks like it’s your own tooth. No glue or any other tool needed, the tooth keeps itself in its place. 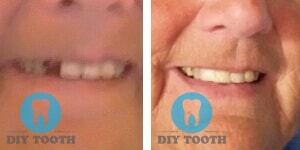 You can make your own tooth in approximately 10 minutes. The material which you can use to make approximately 10 teeth. A manual with simple instructions, explaining how to make the tooth. Always sent within 24 hours, usually delivered within three days (UK). The tooth will last for months, and sometimes up to a whole year. The temporary tooth replaces a completely missing front tooth. 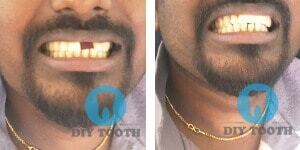 The material thus helps you to create a sort of fake tooth or prosthesis. 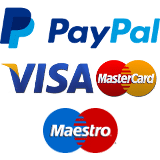 You can easily pay using Paypal and other payment methods. Always sent within 24 hours, usually delivered within three days. 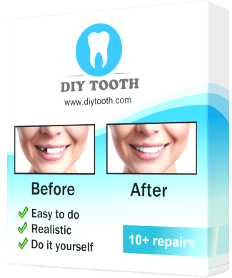 This product allows you to make yourself a temporary tooth in a couple of easy steps. 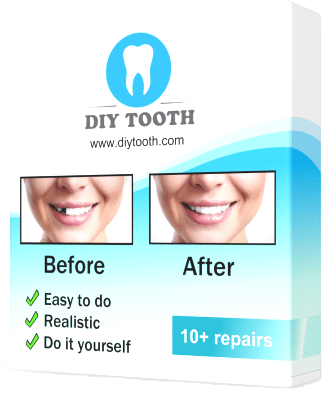 You can order the DIY tooth by clicking “Add to basket” above. 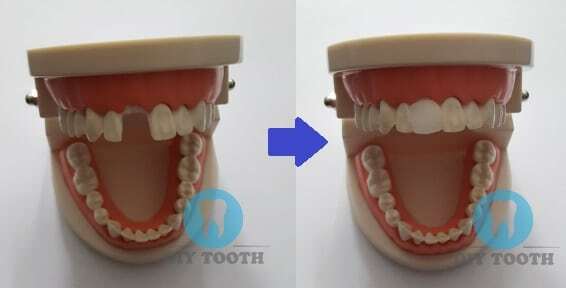 Easily make a temporary tooth without special tools. No glue or adhesive paste needed, the tooth keeps itself in place. Our special, mouldable material can safely be used and does not contain any toxic components. After making the tooth, it is easy to colour it, which is also described in the instruction manual. Sent within 24 hours, usually delivered within three days (UK). Ships from Holland. Worldwide delivery times can be found on the delivery information page. To be honest, for £15 I wasn’t expecting much. But wow, it’s made me feel much better about myself and a great temporary solution. Incredibly easy to make, amazing result! Perfect product to use until my implant is ready. My front tooth broke in a fall, and I can only go see the dentist in three weeks. Very easy and quick to make. Three failures, but it worked the fourth time. I’m a bit clumsy! But I’m very happy with the result, it just needs a little colour, and then ready! Now I can save for an implant without worrying every time I open my mouth. I’m happy!! Surprised at how easy it is to make a tooth! It stays in place really well and looks good. Top product! Works perfectly, exceeded my expectations. The tooth is comfortable. I’m really happy, I wish I’d known earlier about this site! I can laugh again, without a hand in front of my mouth! Easy to make! Thanks! Works, I am very happy with the results. Shipping took 2 days for me. My DIY tooth turned out GREAT,I wear it everyday and it looks great in my mouth until my dental insurance kicks in and I can afford my dental work. Highly recommended! Great product! My smile looks great again! Did not work for me, had to replace two adjacent teeth. Only works when you can snap it between two real teeth. Returned it and got my money back fast, so that went well. Works as advertised, took 3 days to arrive otherwise 5 stars. This product works, exactly what I needed. Insurance told me I need to wait till January to get a tooth implant. Thanks for this. Will the tooth remain in its place? If you’ve made the tooth following the instructions in the manual, the tooth should fit firmly in its place. The tooth will be kept in its place on both sides by the other teeth. Can I keep the tooth in while eating and sleeping? It’s not recommended to keep the temporary tooth in while sleeping. Even when the tooth is firmly fixed in its place, it is better to remove it before going to sleep. We also recommend removing it before eating. Can I use this to replace a molar? The product is suitable for front teeth, canines, and the first small molars. We don’t recommend using the product to replace the large molars at the back. Can I use this to fix a broken tooth? The temporary tooth is not recommended for the repair of a broken tooth. The temporary tooth can only be used to temporarily replace a completely missing tooth. Can I replace more than one tooth? Yes, but the missing teeth cannot be adjacent to one another. You need a real tooth on both sides of the temporary tooth, to keep it in its place. Can the tooth be used for the upper as well as lower teeth? Yes, so long as the temporary tooth can be fixed in between two real teeth. Can I colour the tooth? You can colour the tooth if you wish, the method to do this is explained in the instruction manual. How long does the tooth last? The tooth will last for months. With one jar of material you can make approximately 10 teeth, so you always have some spare material! Your order will be shipped from Holland. 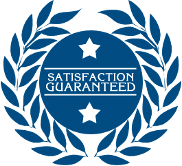 You will receive your order within 2-4 working days (UK), however we usually find that deliveries are within 3 days. The product is sent as a letterbox shipment, so you don’t have to stay at home to receive it, since it fits through the letterbox. Worldwide delivery times can be found on the delivery information page. The temporary tooth is, as the name says, a temporary solution. For a more permanent solution, you should contact your dentist. Make sure the dentist checks your teeth regularly so they stay in good condition. Not replacing a missing tooth can cause problems in the long term. This should therefore be considered purely a temporary solution.